2 Moral Realists Moral realists hold that things should be taken at face value. 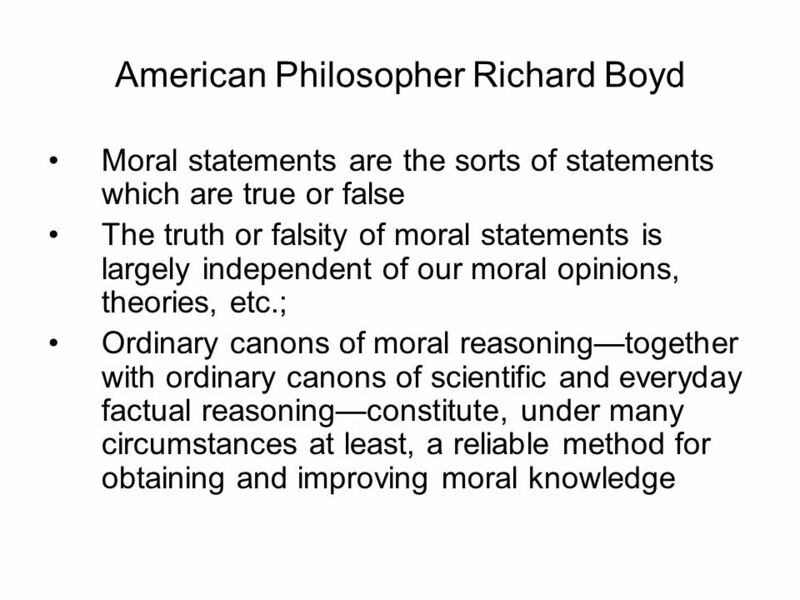 Moral claims do purport to report facts and are true if they get the facts right. 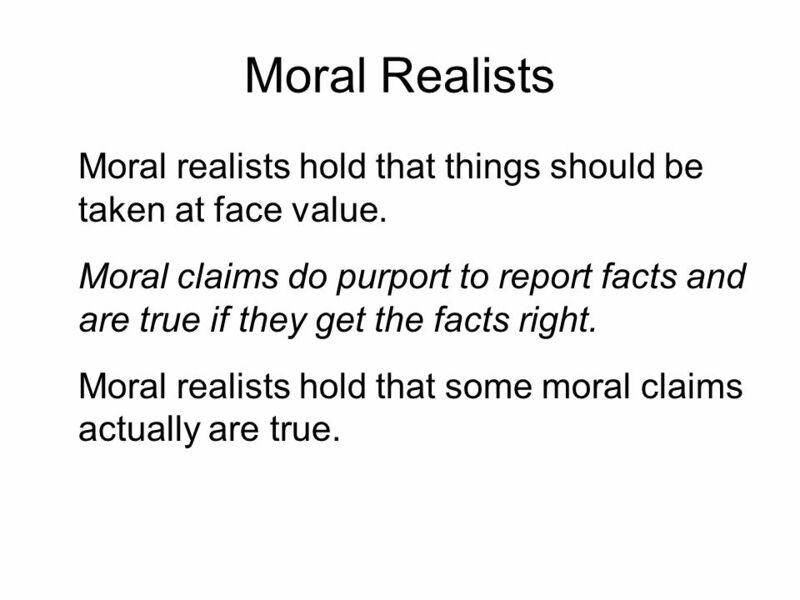 Moral realists hold that some moral claims actually are true. 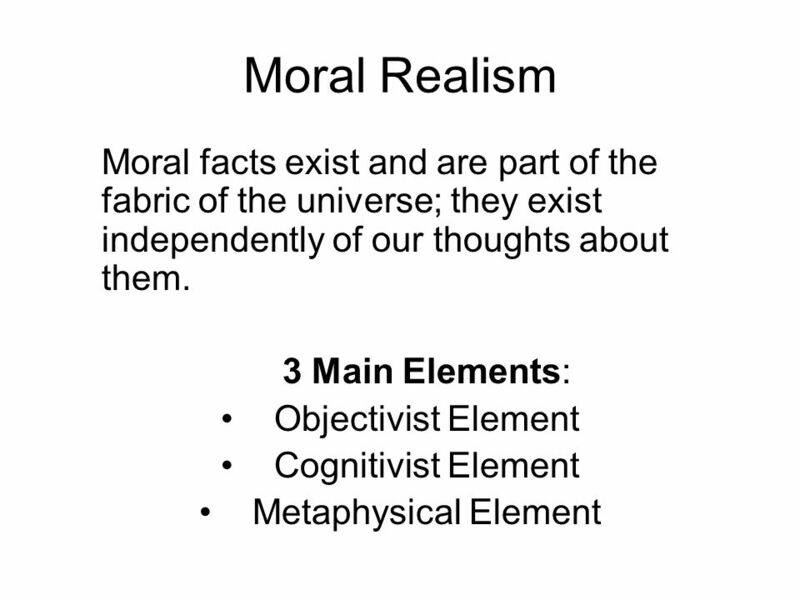 3 Moral Realism Ethical sentences express propositions. Some such propositions are true. Those propositions are made true by objective features of the world, independent of subjective opinion. 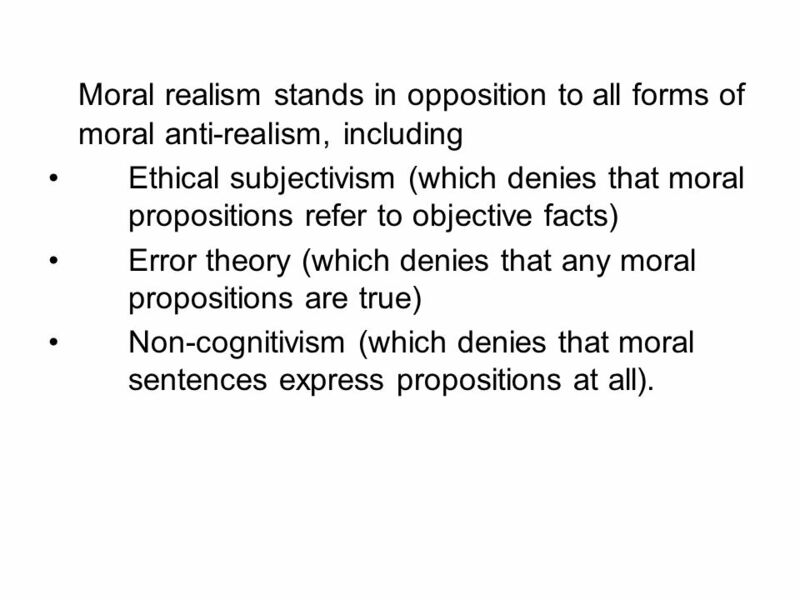 Ethical subjectivism (which denies that moral propositions refer to objective facts) Error theory (which denies that any moral propositions are true) Non-cognitivism (which denies that moral sentences express propositions at all). and do not depend on social approval. 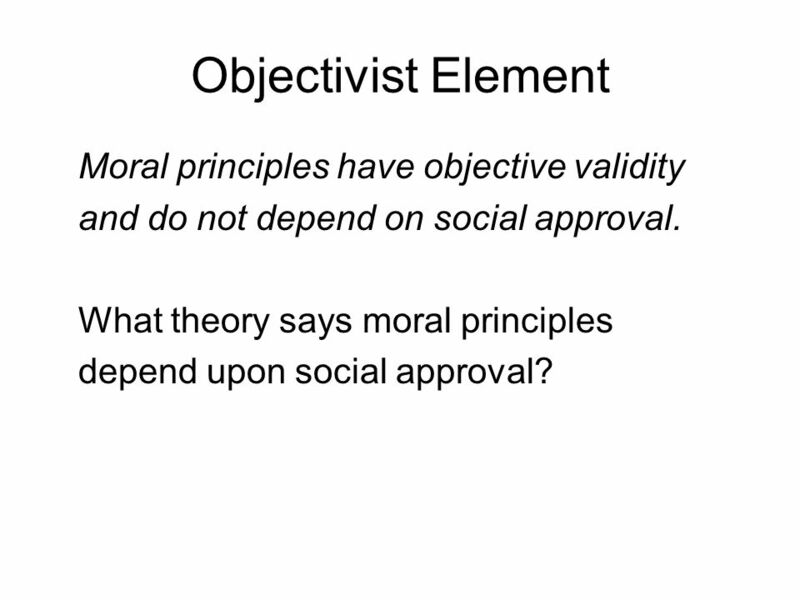 What theory says moral principles depend upon social approval? 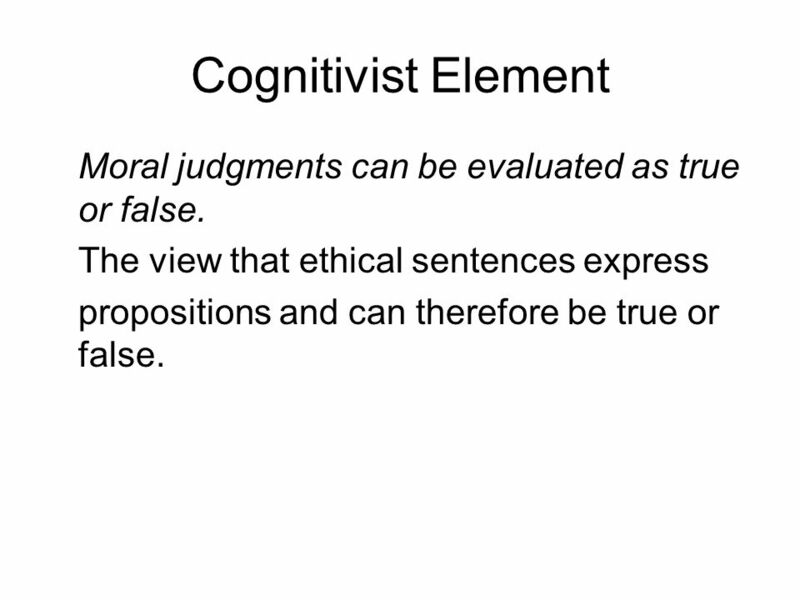 8 Cognitivist Element Moral judgments can be evaluated as true or false. 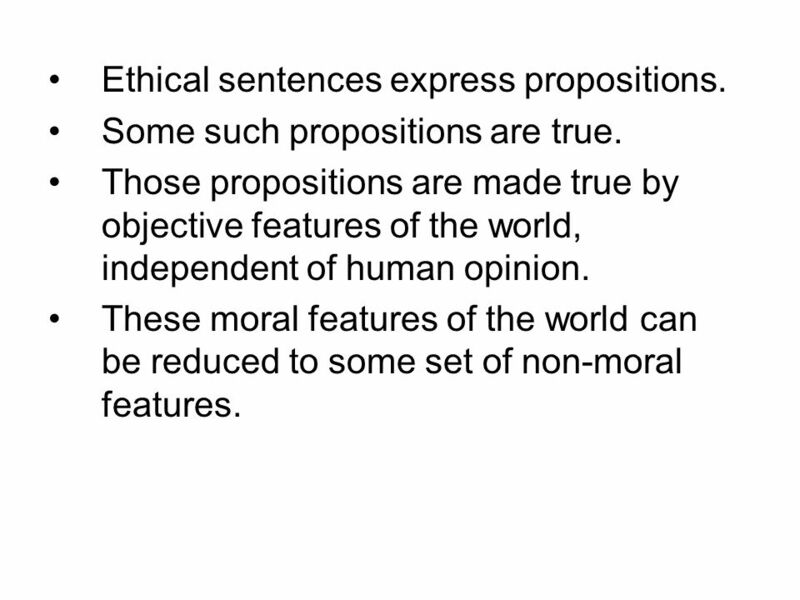 The view that ethical sentences express propositions and can therefore be true or false. 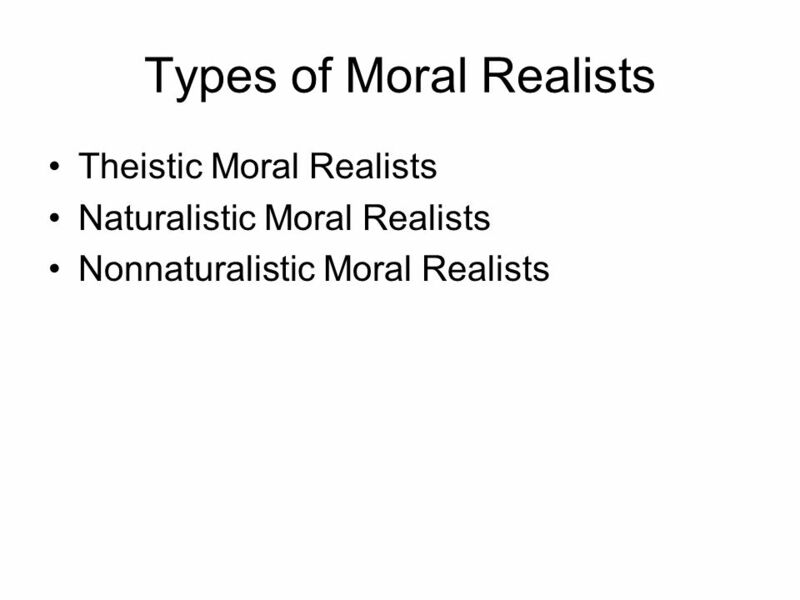 9 Moral facts exist in reality. 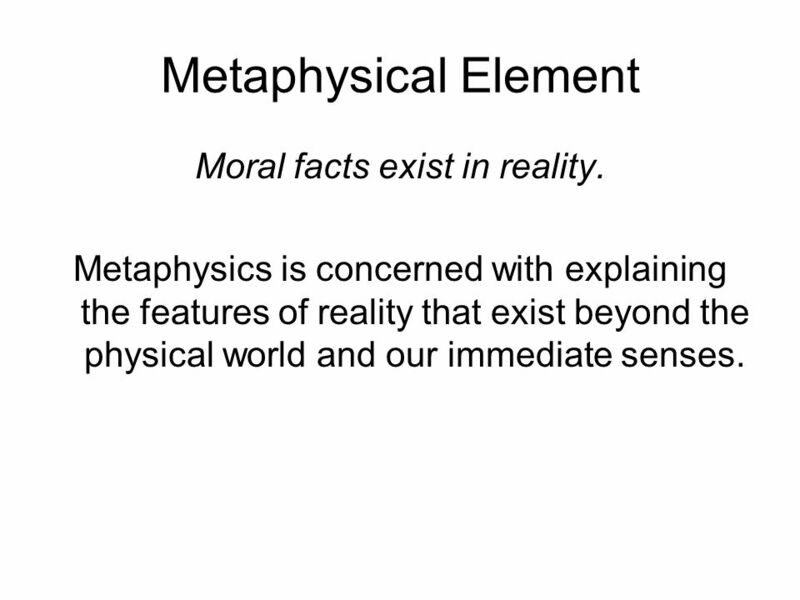 Metaphysical Element Moral facts exist in reality. Metaphysics is concerned with explaining the features of reality that exist beyond the physical world and our immediate senses. 13 Ethical sentences express propositions. Some such propositions are true. Those propositions are made true by objective features of the world, independent of human opinion. These moral features of the world can be reduced to some set of non-moral features. 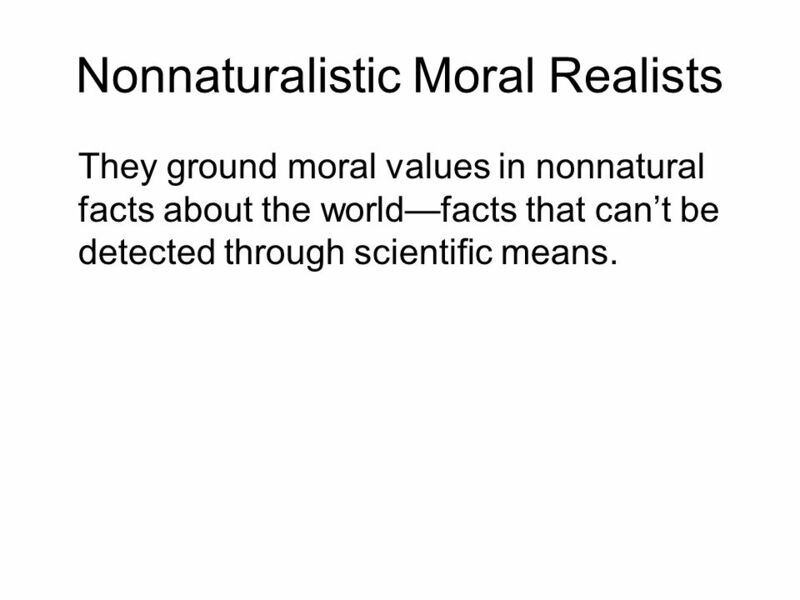 They ground moral values in nonnatural facts about the world—facts that can’t be detected through scientific means. 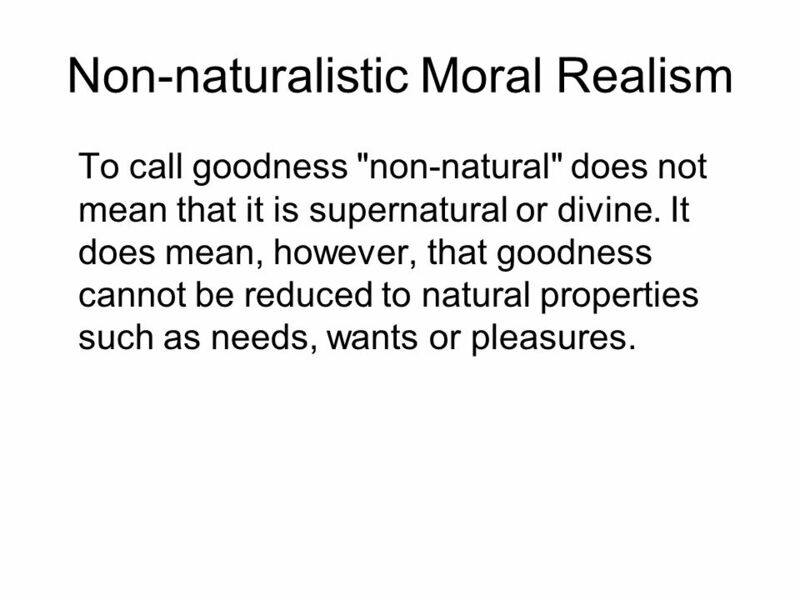 To call goodness "non-natural" does not mean that it is supernatural or divine. It does mean, however, that goodness cannot be reduced to natural properties such as needs, wants or pleasures. 17 J.L. 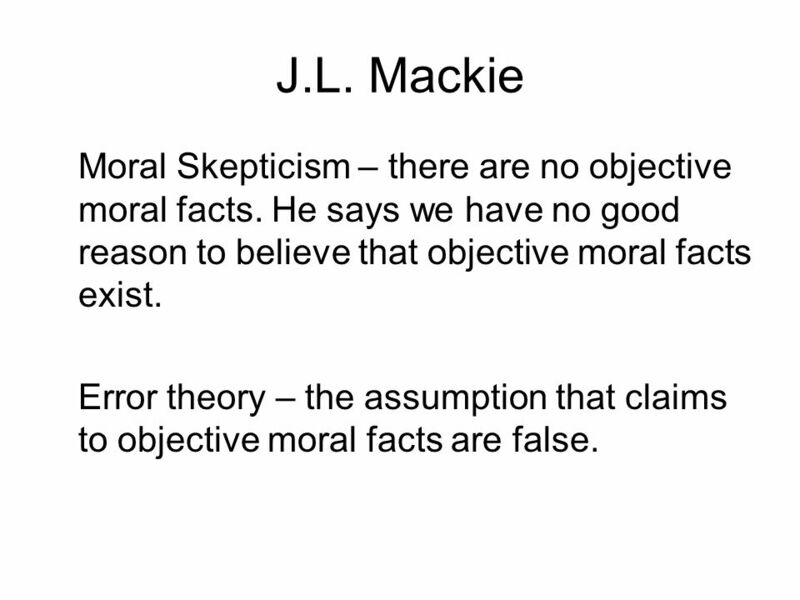 Mackie Moral Skepticism – there are no objective moral facts. He says we have no good reason to believe that objective moral facts exist. Error theory – the assumption that claims to objective moral facts are false. 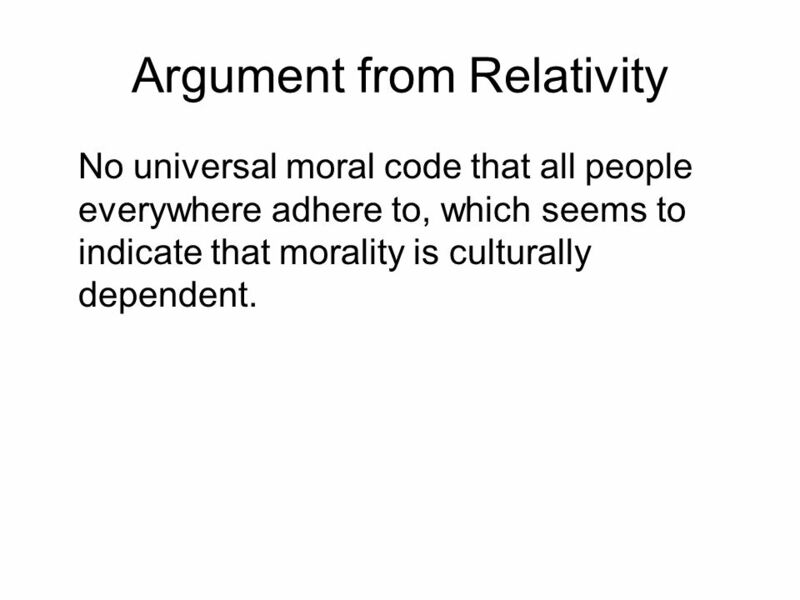 No universal moral code that all people everywhere adhere to, which seems to indicate that morality is culturally dependent. 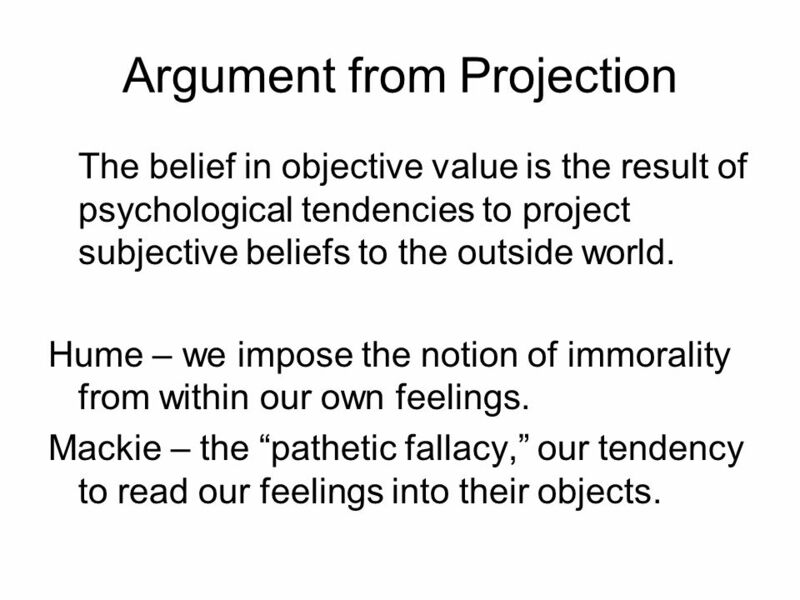 The belief in objective value is the result of psychological tendencies to project subjective beliefs to the outside world. Hume – we impose the notion of immorality from within our own feelings. 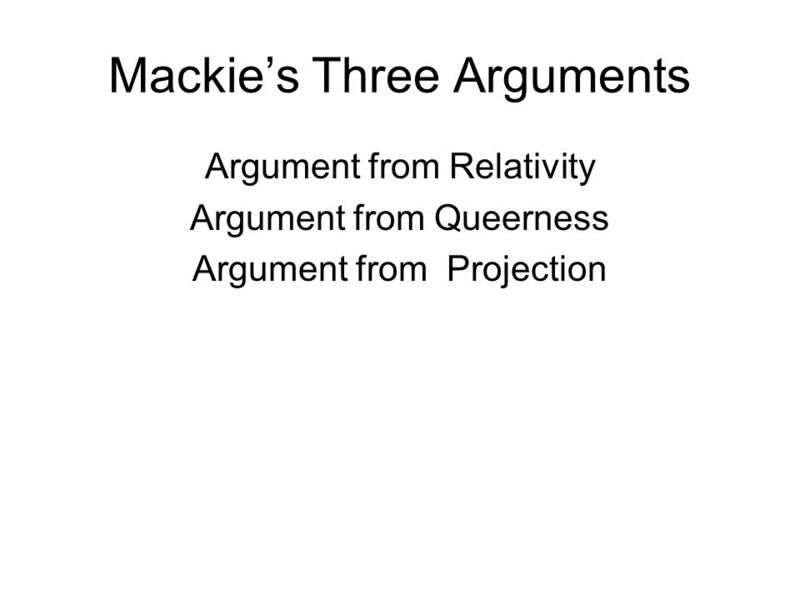 Mackie – the “pathetic fallacy,” our tendency to read our feelings into their objects. 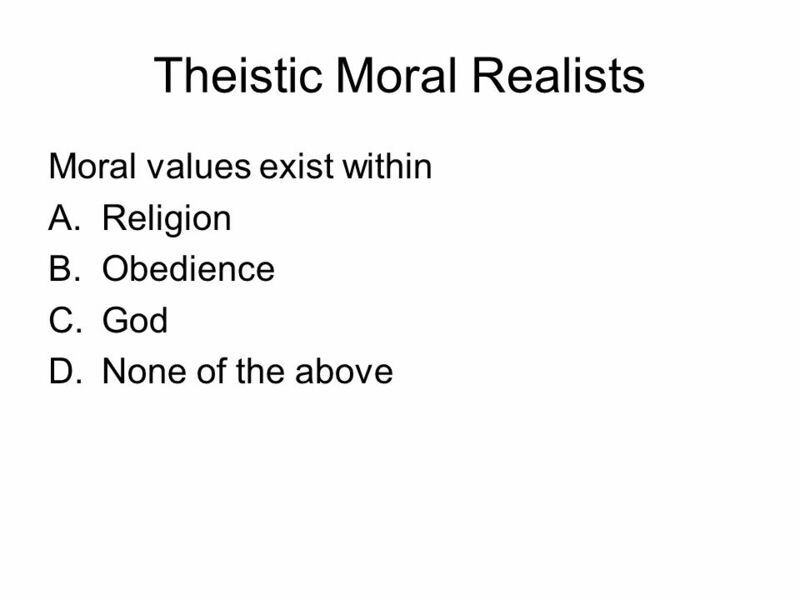 23 Moral Nihilism The doctrine that there are no moral facts, no moral truths, and no moral knowledge. Morality is simply an illusion: nothing is ever right or wrong, ust or unjust, good or bad. 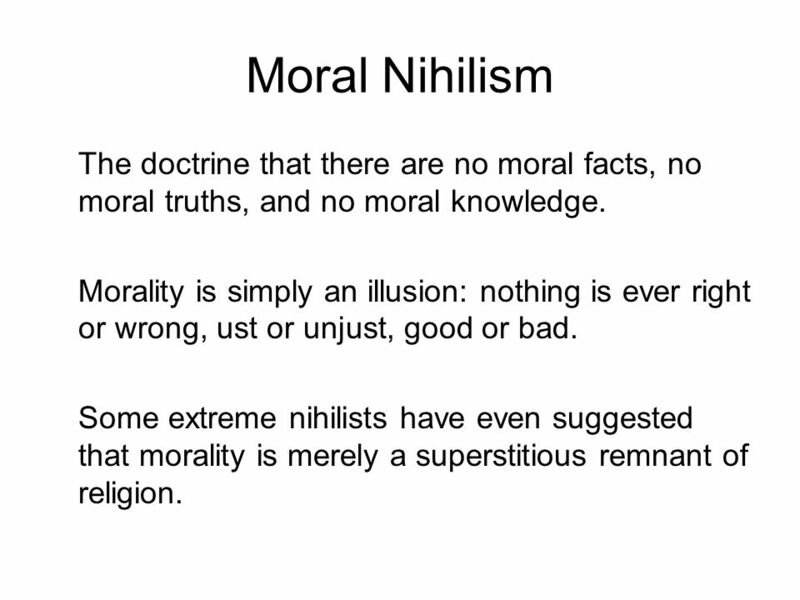 Some extreme nihilists have even suggested that morality is merely a superstitious remnant of religion. 1. 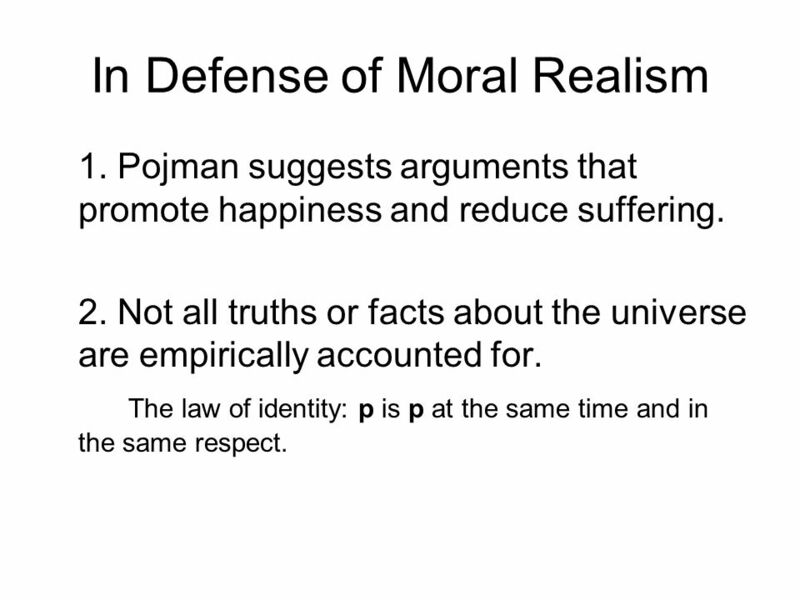 Pojman suggests arguments that promote happiness and reduce suffering. 2. Not all truths or facts about the universe are empirically accounted for. The law of identity: p is p at the same time and in the same respect. Color is not in the object itself, but there is a causal relationship between the light rays and our perceptions. 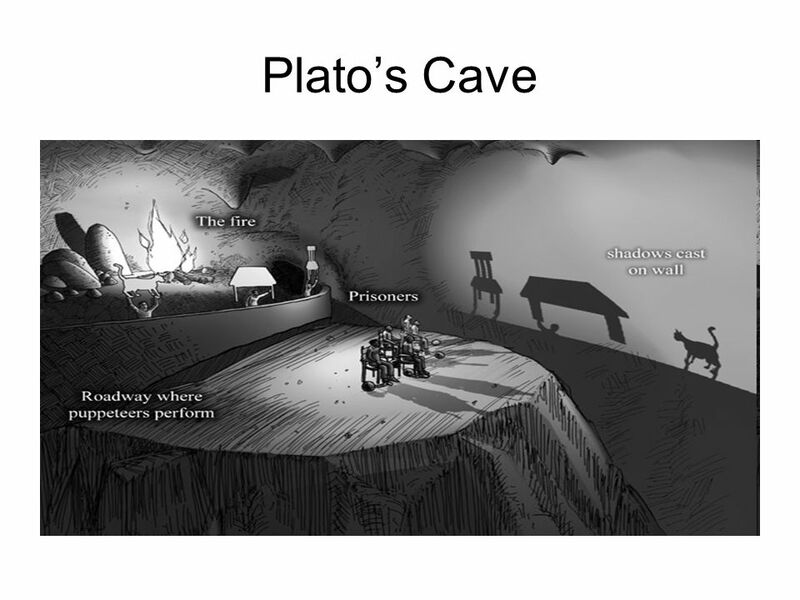 Similarly, moral properties may supervene, or emerge out of natural ones. 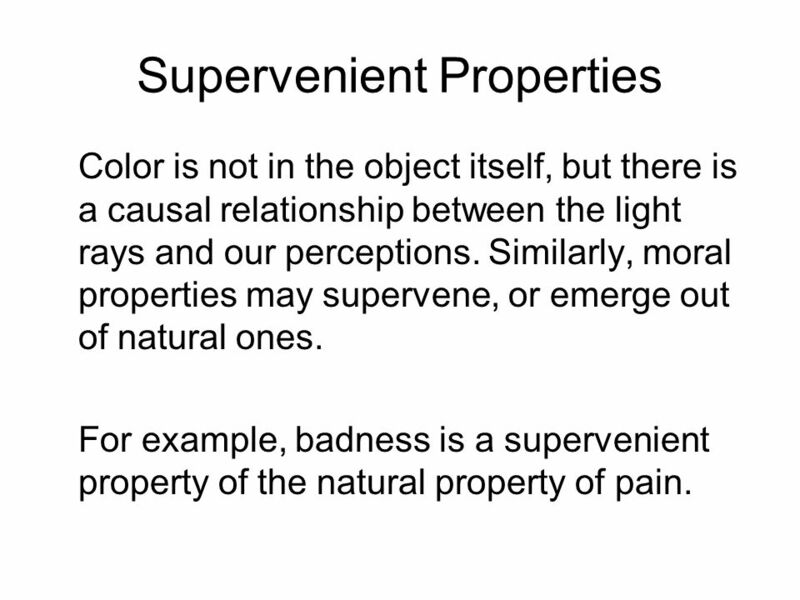 For example, badness is a supervenient property of the natural property of pain. 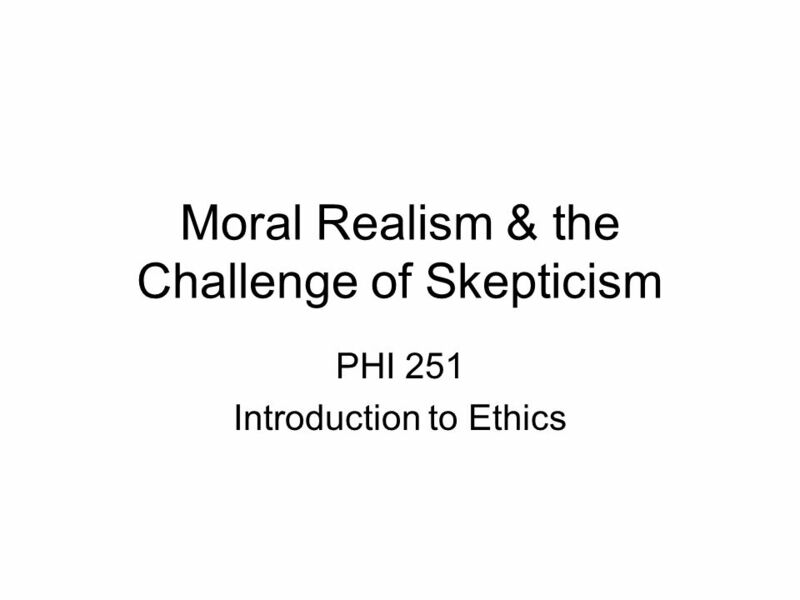 Download ppt "Moral Realism & the Challenge of Skepticism"
WORLD VIEWS: WHAT IS TRUE? 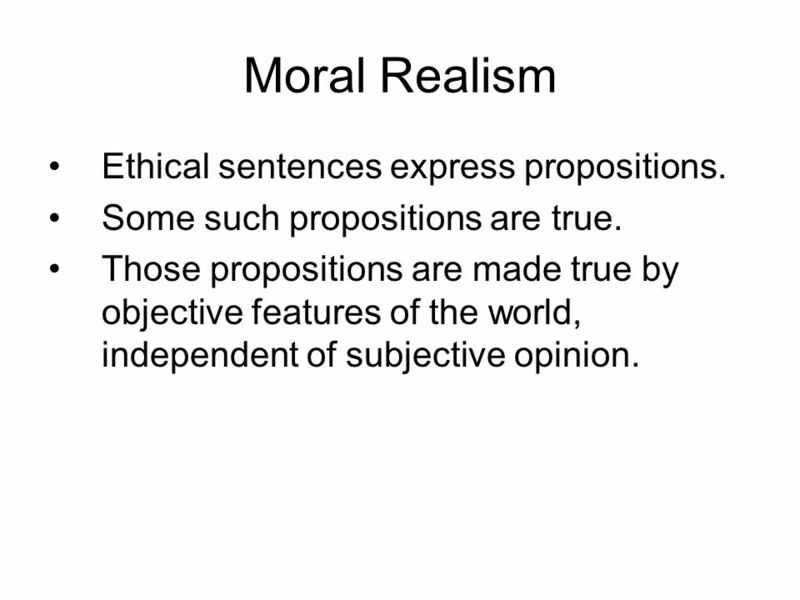 Topics in Moral and Political Philosophy Moral Relativism. Naturalism The world we live in. Supplementary Reading A Field Guide to Recent Species of Naturalism Alex Rosenberg The British Journal for the Philosophy. From Last time Cognitivism vs. non-cognitivism Subjective descriptivism Cultural relativism Divine Command theory. Introduction The Soul and the Body. Paul Gauguin (1897) Whence come we? What are we? Whither go we? Introduction. 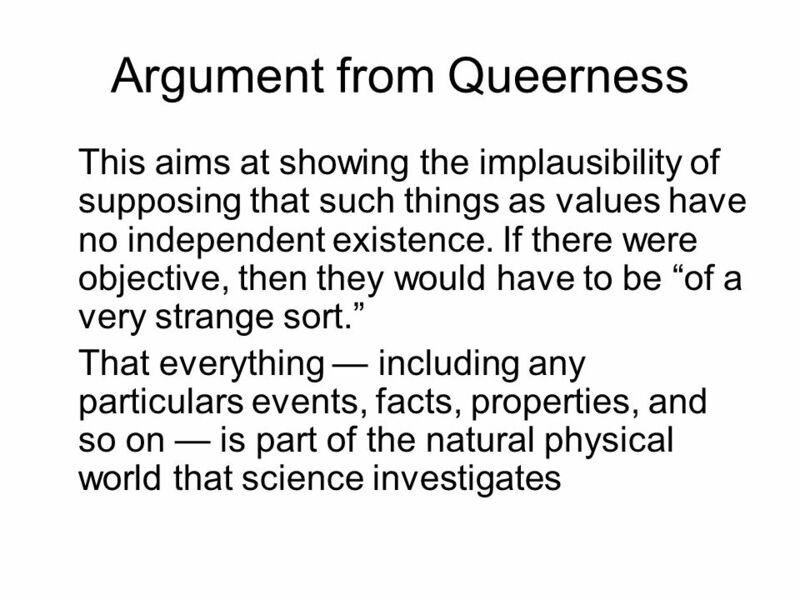 Scientific realism. Varieties of (the problem of) realism Ontological: is there a mind-independent world? Epistemological: can we know something about. Sexual Perversion. in-class activity 1. What sorts of sexual activities do you think are clearly perverse? 2. What do you think might make them perverse. 1 Meta-ethics Section 3 Moral Realism. 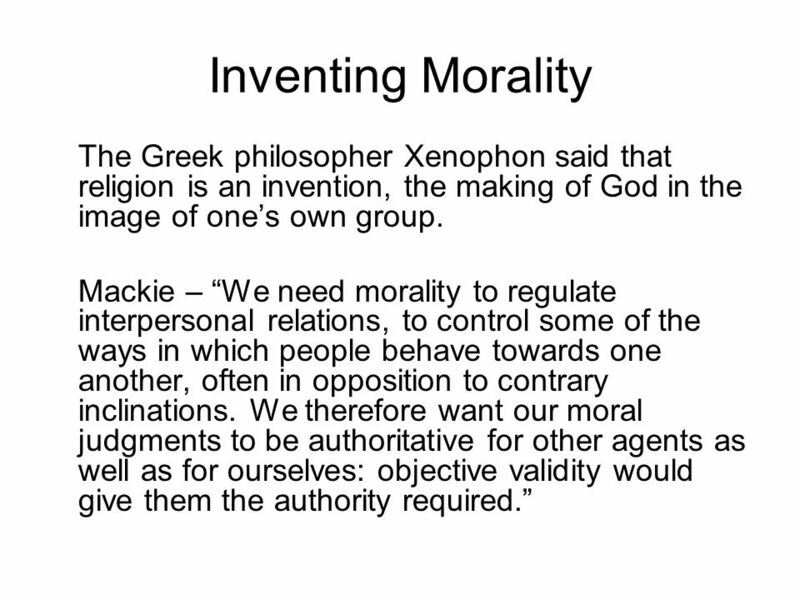 2 Holds that moral properties are real & independent of people’s states of mind. Moral claims can be true or false.